At first glance, the hairstyles at the CMT awards last night were disappointing…but there were some highlights! 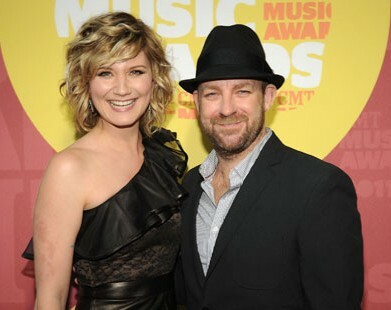 Among the best tressed are Sugarland‘s Jennifer Nettles (above) and Steel Magnolia‘s Meghan Linsey (below left). Judging from our stats, you like their looks a lot. Both dos are on the shorter side, distinguishing them from other country music stars. Other unique touches are Jen’s layers and Meghan’s side ponytail. Sheryl Crow and Sara Evans (above right) deserve honorable mentions. They don’t change their hair often, and they don’t have to because their trademark looks work perfectly. Of the two, Ms. Crow goes longer with bronde highlights and loose curls. Sara’s straight locks are slightly angled around the face and styled to be super sleek and shiny. Lady Antebellum’s Hillary Scott (above) did something different with her hair, and the results were so-so. The crown wasn’t full as it usually is and the curls were looser than normal. Lady A. frequently dons a half-upsweep so that touch doesn’t come as a surprise. Ending with the worst, we give Laura Alaina a big thumbs-down (she doesn’t look like an American Idol runner-up!). Her high-contrast haircolor could be labeled as a very bad ombré, but it’s really like a past trend that was never very good–a very different color like black under a light shade such as platinum blond. This entry was posted in Country Music star hairstyles, Music, star hairstyles, star styles that work in real life, TV and tagged American Idol, Country Music Television, Hillary Scott, Jennifer Nettles, Jennifer Nettles' hair, Lady Antebellum, Meghan Linsey's hair, Sara Evans, Sheryl Crow, Steel Magnolia, Sugarland. Bookmark the permalink. Pingback: Bon Jovi feat/ Jennifer Nettles, “Who Says You Can’t Go Home.” Official Full Length Country Music Video. « Top 5 Gone Wild: Country Countdown.